Today marks what would have been the babies' birthday had they been obedient. It is only fitting that in keeping with their disobedient natures that they completely fussed up a storm from the moment I got home. Jen and Lauren would argue that they had been fussing up a storm before I got home from work but honestly they weren't bothering me at all then. When I got home all seemed well. Our super was visiting with his family and after he left Elliott settled down into his Boppy to watch some Olympic rowing. With the babies somewhat passive I had to act fast! 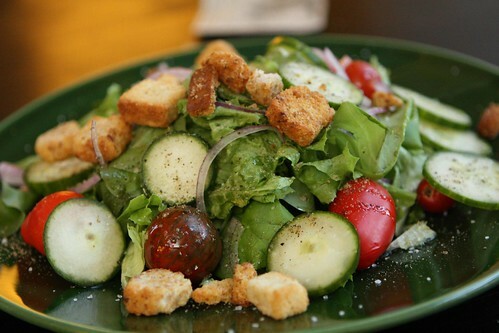 I made a quick salad with Gotham Greens, cucumbers, red onion, croutons, and Abraham Lincoln tomatoes from Lauren's garden. They looked a lot like Abraham Lincoln if you cut him open. And he was filled with seeds. 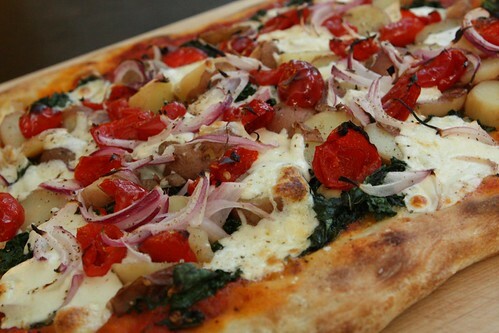 After the salad I threw together a very quick pizza with boiled baby potatoes, kale and garlic from the farm, peppadew, farm red onions, mozzarella, pizza sauce, salt, and pepper. Today, as you are I'm sure aware, is International IPA day. 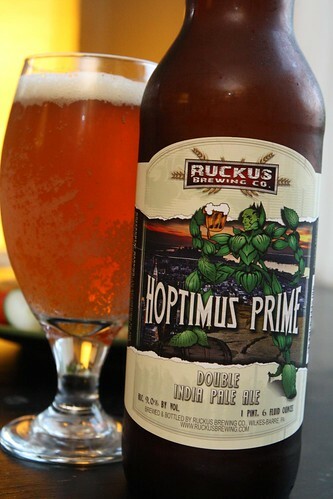 For the occasion I cracked open this Hoptimus Prime from Ruckus Brewing Co. This was really nice, even better than I expected. It was nowhere near as hoppy as I would have thought. That may be because my palate has so adjusted to hops now that nothing really shocks it anymore. This beer did have a lot of flavor going for it, which I like. It wasn't just trying to shock me with pure bitterness. That is something this beer does not have in common with our babies. Elliott would only stop fussing for a minute and only if Lauren held him in this extremely uncomfortable position. Well, uncomfortable for her. Elliott seemed okay with it. Tonight was Lauren's last night with us. Also, it was our last night before we go nearly sixteen hours with no help at all! It's going to be pretty rough. So it was that we enjoyed her farewell dinner with a good number of babies crowding us at the table, demanding snuggles every minute or two until we were eating pizza slices one-handed, dropping the odd topping on their heads as we followed the Olympic action. It's exciting watching the Olympics. The down side was that all three of us had already been spoiled on the results of today's events. It's tough living in today's modern world with its cell phones and Palm Pilots. Who knows what marvels will await the twins when they come of age? I bet it's gonna be Google Glasses!